Our liqueurs, we offer a range of fine liqueurs based on fruit and Cognac. Six delicious flavours Orange, Pear, Coffee, Almond, Raspberry, Abricot. Liqueurs aged for at least two years in Limousin oak barrels to bring about a successful marriage of fruit and alcohol. 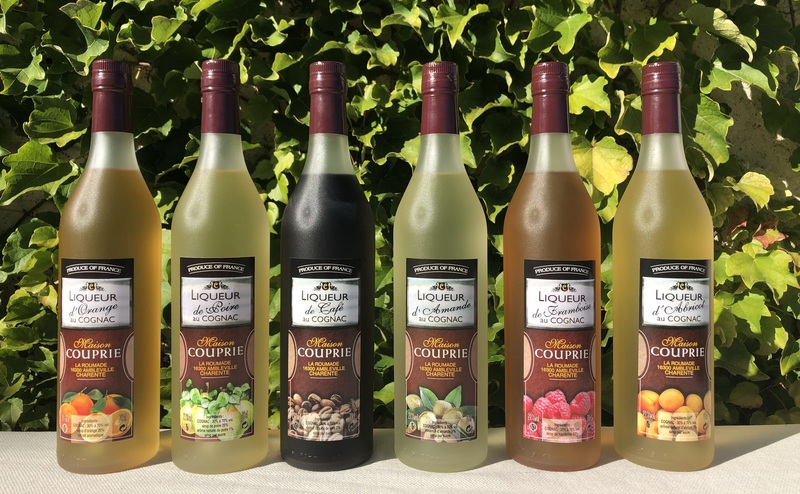 Our unusual liqueurs are made from a careful blend of fruit extracts and natural flavourings with Grande Champagne Cognac to produce a light, very fruity drink. These liqueurs are enjoyable on their own or in a cocktail. Round and delicious, they make an ideal accompaniment to desserts. Here are a few suggestions: Coffee liqueur and tiramisu, raspberry liqueur and strawberry tart, pear liqueur and rich chocolate cake…We also suggest the following cocktail: 1/4 Cognac,1/4 apricot liqueur,1/2 orange juice and a dash of strawberry squash. L’abus d’alcool est dangereux pour la santé. A consommer avec modération. La vente d’alcool est interdite aux mineurs. The sale of alcohol is prohibited to minors. Alcohol abuse is dangerous for health. To consume with moderation.